Red/Amber LEDs: Red/Amber Light Therapy helps promote photo rejuvenation. Light therapy helps reduce the appearance of fine lines and wrinkles on the hands. Skin appears much smoother, tighter, and younger. Infrared LEDs: Ifrared Light Therapy can help blood flow. 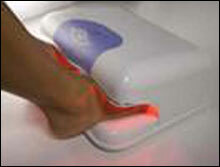 The Footspa uses the same LED Light Therapy as the Handspa to make feet look young again. Both treatments are completely painless, with absolutely no recovery time after using them and you can return to normal daily activities after each treatment session. Most people start noticing that their skin is softer and smoother after the first session and see maximum results by the sixth session, although many clients use the devices every week to keep hands and feet looking their best.